This Garlicky and Cheesy Asparagus recipe is made with just a few simple ingredients and makes a perfectly delicious side dish for any meal! 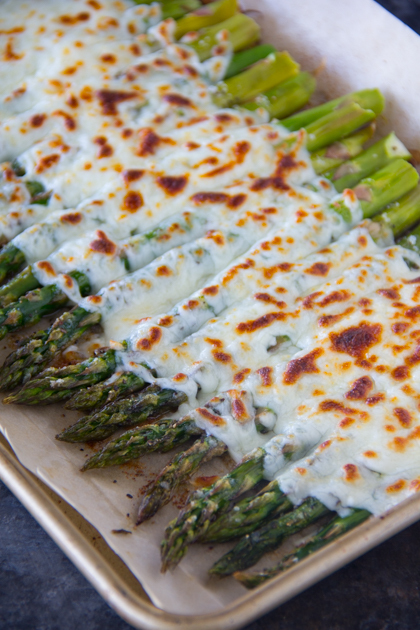 I absolutely love asparagus and roasting it in the oven makes it simply irresistible. We usually pair this Garlicky and Cheesy Asparagus Recipe with this delicious Maple Glazed Salmon for an easy peasy dinner. Did I ever tell you that I simply cannot live without cheese in my life. I often wonder how people do without it. Not me!! The gooeyness of it all is just simply life changing. 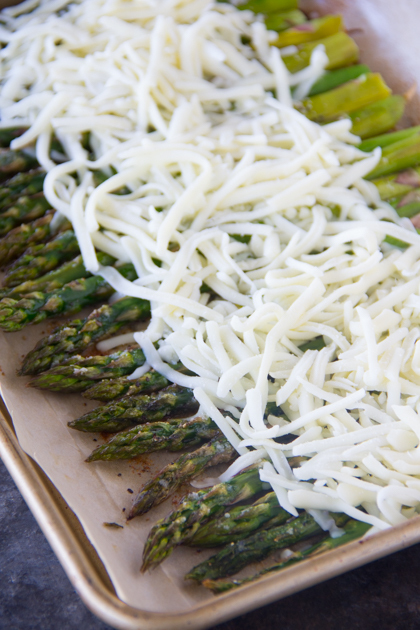 This Garlicky and Cheesy Asparagus Recipe comes together so easily with just a few ingredients. I combine olive oil, salt, pepper, and of course, the two main characters, garlic powder and ooey gooey mozzarella cheese. How perfect does this ooey gooey goodness look?!?!?! Don’t you just want to dig right in? Simply a must try, guys!! Speaking of goodness, I start to think of the Psalm 34:8 scripture, “Taste and see that the LORD is good; blessed is the one who takes refuge in him.” His goodness is so personal in that He meets our individual needs with it. This same goodness draws us closer and closer to Him and in turn causes us to share His goodness with others. In what ways has God been good to you this week? Say Grace and enjoy! Place prepared asparagus on parchment. 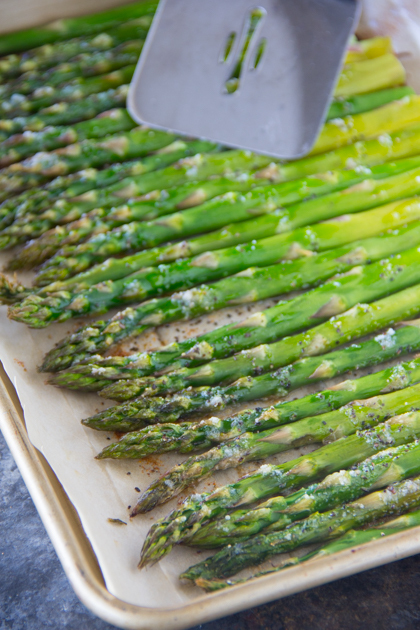 Sprinkle olive oil, garlic powder, salt and pepper over the asparagus and toss. Remove from oven and top with the mozzarella cheese. Place under broiler until the cheese melts and starts to scorch, maybe 3-4 minutes. Add more salt if desired. Say Grace and enjoy immediately. I love making asparagus in the oven — it’s the best! I have never thought to add cheese to roasted asparagus before. I have to try it! It looks incredible! Just pinned this is gorgeous side dish! 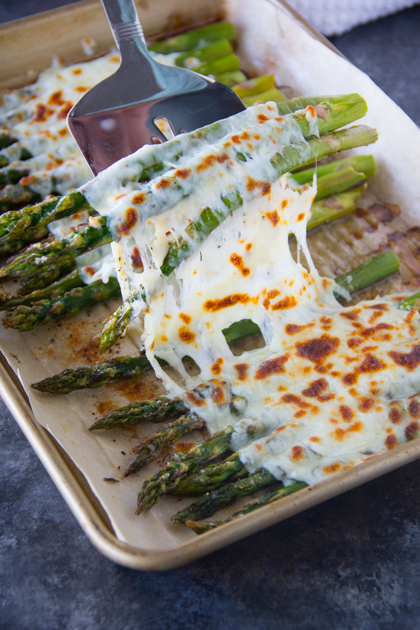 You had me at garlicky and then you added cheese to the oh-so-loved asparagus…winning on all fronts! Thanks for the recipe inspiration! I just did something similar for Easter. Asparagus is such a great and delicious veggie. Roasting it and adding cheese is a great way to enjoy it too. This looks so good, feel like having it right now. 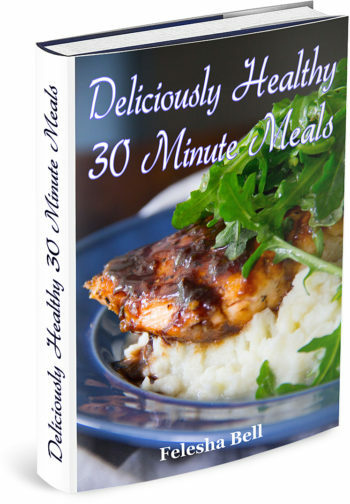 Perfect for sides or as a snack.